We have finished up all of the Drive, Chip and Putt local qualifiers! We had a total of 575 participants competing in local qualifiers at PGA National Golf Club, Vineyards Country Club, Weston Hills Country Club, and The Club at Ibis. .Every participant went through each station; driving, chipping and putting. We are excited to announce the following individuals who qualified to move onto the sub regional qualifiers at Bonita Bay Club on August 11th and Lost Tree Club on August 18th. From three of these local qualifiers 72 participants moved on to the Sub-Regional qualifier at Lost Tree Club on August 18th. These 72 participants competed at PGA National Golf Club, Weston Hills Country Club, and The Club at Ibis. From Vineyards Country Club 24 participants will be moving on to the Sub-Regional qualifier at Bonita Bay Club. 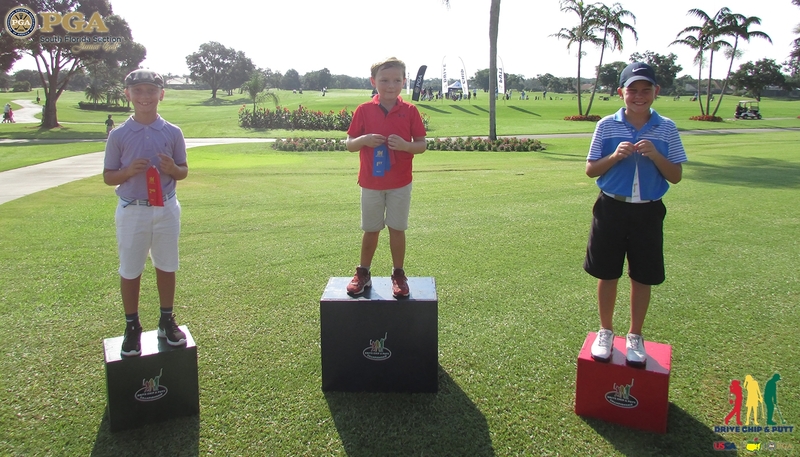 Click here for full results from all of our Drive, Chip and Putt qualifiers. If you are interested in volunteering for any of the upcoming Drive, Chip and Putt qualifiers please contact mtemple@pgahq.com. The South Florida PGA is fortunate enough to hold all Drive, Chip, and Putt qualifiers in the South Florida Region. Throughout the summer, the South Florida PGA conducts multiple events for juniors of all ages. For more information on the South Florida PGA Junior Programs please visit the South Florida PGA Junior Tour website at www.sfpgajuniorgolf.com.